Beyond this, there was little other discussion. Ron Lewis echoed Greenan’s disappointment in the failure to agree. In the end the resolution was passed 6-1, with Jake Sticka voting nay. 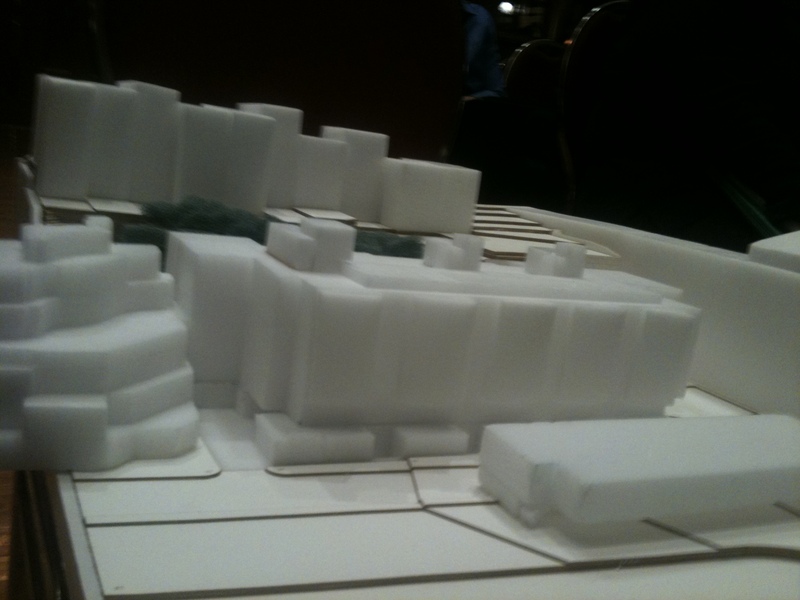 EastBanc presented its plans to build condos on the site of the Key Bridge Exxon (which will close in 2012). The plan calls for 35-37 units in the building shown above. GM can say that the other renderings make this project look slightly better than this photo above, but not that much better. The problem isn’t as much with the building itself, as with the setting. The beautiful and massive Car Barn sits just to the east and a contemporary and busy (and in GM’s opinion, tacky) apartment building sits to the west. It may be impossible to bridge that gap, stylistically. (That big square that looks like it’s sitting on Canal Rd. is just the possible penthouse removed. It probably won’t be part of the final design. Actually, none of this will probably be part of the final design, but that definitely won’t be part of the final design). The neighbors want the building to be built basically as a wedge into the side of the wall in order to minimize the effect on their views. GM’s skeptical that would work. But he really can’t see the OGB accepting this plan as is. Either way, get used to hearing about it. 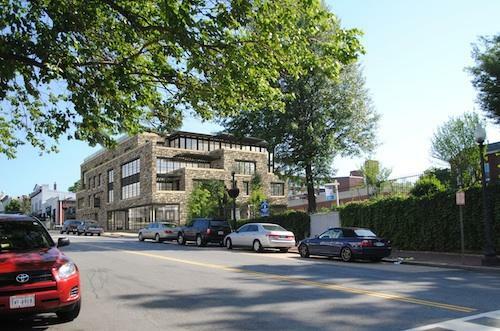 This would be primarily an apartment building, offering 9 huge units. There would also be some ground floor retail. The most significant aspect of this project is the material: stone. It is meant to echo the stonework around the canal. It’s a good thought, but it gives the project a rather imposing hulking feeling. Maybe the details would lighten the impression. That impression is particularly strong when viewed from the tow path. As proposed it would have five stories of pure stone. GM actually thinks the design works best on that side, for some reason, but from the front it has a bit too squat a look. We’ll see. Jack Evans floated the idea of adopting an nonbinding law through the council calling for Patrick Pope to return to Hardy. He sounded out the crowd on the possibility. The general consensus seemed to be that the whole point to having a Chancellor is to avoid the council getting involved in these issues and it would set a bad precedent to start now. Evans didn’t quite agree, but seemed to get the message. The Hurt Home developers have agreed to rehab Montrose Park’s tennis courts as part of their “community benefit” requirements. Some new stores opening: Ann Taylor Loft (next to Madewell), Fleurir Hand Grown Chocolates (on P just west of Wisconsin), Lou Lou (where Giovanni is now), and some place called Babette in Cady’s Alley (that one might be open, but GM’s not sure). DPW plans to start cracking down on trash violations soon. Like it or not, that means not putting any trash on the sidewalk in trash bags; it all needs to be in a trash bin. As I commented to you yesterday, both of these East Banc plans are really sub-par and disappointing given some of the better efforts the company has produced elsewhere, such as Cady’s Alley. The Key Bridge site is a key entrance to the village, and the proposed structure looks like a Holiday Inn from the 1960’s. The Verizon site structure may try to reference the stone of the beautiful bridge, but none of the actual buildings in that immediate area are built of that type of stone: they are brick, and pretty short. Perhaps some stone facing on the canal side and brick facing on the street side would be better, but the massing is also unattractively collegiate and inappropriate to the site. Too big, too ugly, and totally out of place. No respect for Georgetown. 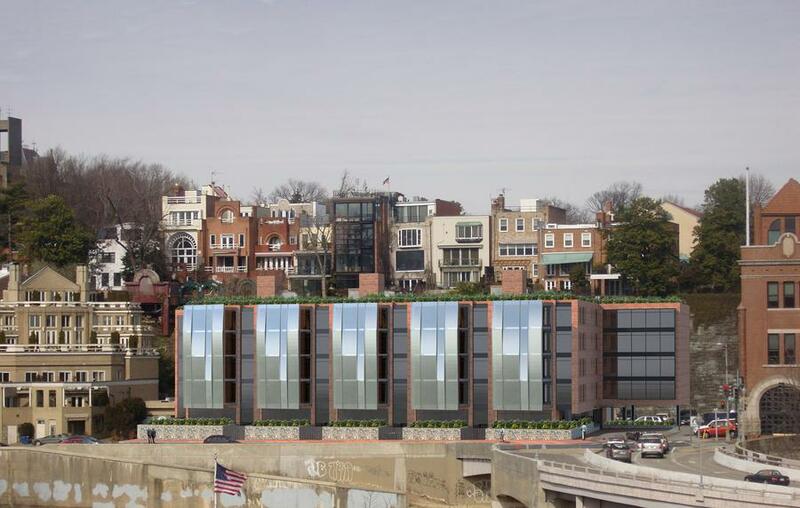 That building is ugly, but a large slab of concrete and an Exxon station is appropriate for the space and “respectful” of Georgetown? The only problem with that building is that it’s not tall enough, but I suppose they made that concession out of respect for the Prospect street neighbors (or out of respect for their lawyers). Great news about the tennis courts. Those courts are really bad. Any idea on a timeline for the construction of the courts?? No, not yet. They probably won’t start on the courts until they finalize the deal with the city, which probably won’t be until the fall or so. I agree those courts are in some very sad shape. The only reason I may still avoid these courts even after they’re renovated is that the fence is too small. There’s so little room between the baseline and the fence, it’s difficult to play comfortably. But, I too very much look forward to the courts being brought back to life.